Yes, that’s correct. Even though the plastic bottle itself can be recycled, it’s all a different case with the caps; they might not be recyclable! In fact, most of plastic bottle caps are unrecyclable. Most recycling curbs do not accept plastic bottles with caps so we’d better take them off before sending the plastics to them. So what do we do with these caps? Throwing them away to the landfill? I hope that’s your last resort! There can be just so many things you can do creatively with these plastic caps. Some are discussed here. The blog post is actually about reusing plastic bottles creatively, but some include the caps in them. It’s really a blog worth checking out. Other things you can do with plastic bottle caps, well if you are an artsy person, this video below might interest you. So, if you can’t throw them away, make art out of it! Or curtain. In the mean time, you can store your empty plastic bottles (without caps and labels) in our totally recyclable fiber barrels until they’re ready to send off to the recycling companies. 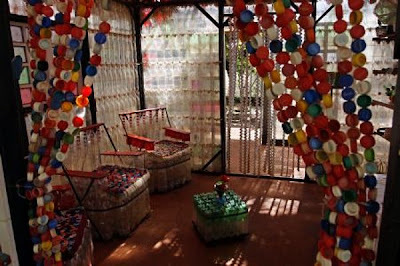 That's really a great post..This post given a fabulous idea's that how we can store our empty plastic bottles and make a beautiful art with them..That's really very idea..